Fitting out the communal area of your nursing home with the right furniture creates a space where residents gain the health benefits of social interaction. Dining areas and lounge areas encourage people to chat and spend time together, all of which leads to a greater sense of connection and individual well being. Furniture for nursing home dining rooms need to be durable and suitable for the requirements of older residents and the staff who care for them. Hill and Hill have a large range that suit these requirements without compromising on style. After all, your residents deserve a home from home feel. This is balanced with your staff needs; being able to work in a setting which allows them to deliver the optimum care. Our range of nursing home furniture for your dining room comes in a variety of specifications. Traditional or contemporary styling incorporating a variety of colour schemes and fabrics ensures you will find furniture that is both practical and stylish. We supply chairs, storage solutions and tables. See our range of dining room furniture here. We know you want to combine support and comfort within robust practical lounge furniture to ensure a quality communal area for relaxing, conversing and entertaining your residents. You need not compromise on style with nursing home furniture from Hill and Hill, though. Whether you are looking for arm chairs, wing chairs or seating with a high back to offer extra support we have retro or contemporary styles. With a choice of fabrics and colours you can create a welcoming space to encourage social interaction and foster friendships. All of which are important to health and well being. Our furniture is also practical and durable with features like waterproof fabric or waterproof linings conforming to rigorous safety standards. Apart from seating we also have wooden coffee tables, book cases and display units to create an all round homely environment. Don't forget those important finishing touches to your nursing home furniture to really make a difference to your lounge. Getting your choice of furniture just right is an important decision and we are here to assist you at every step of the way. Please get in touch with any queries about what we offer, we're always happy to help. 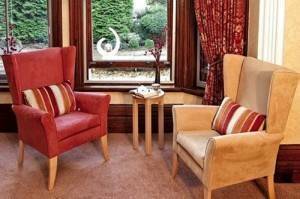 Read more about our nursing home furniture.